Yesterday was Mother's Day here in France, and I had a wonderful one. I was awakened at 7:30 am by a very excited Lambchop #1 bearing gifts. She had been hiding them all week long and couldn't hold her secret in any longer. Lambchop #2 followed soon after with an offering of his own. Very sweet. I loved the gifts, too. When do kids stop making things for Mommy and Daddy at school? That will be a sad day, I think. Anybody who enjoys crafting as much as I do can certainly appreciate a hand-made gift from their own kids. Speaking of hand-made gifts, Lambchop #2 was invited to the birthday party of a little girl in his class. I'm not a big fan of buying junky plastic toys for kids that age. They get broken with amazing speed and efficiency, and since the kid in question is female, I figure a little hand-made bag would be better. I let Lambchop #2 raid my fabric stash, and he picked out some blue fabric with stars. My great-aunt gave me this fabric, which she most likely picked up at someone's yard sale. It's cute, and just masculine enough that my boy could get on board with it. That became the inner lining, the straps (which, as my husband pointed out, at their length, only one would have been necessary) and the front pocket. 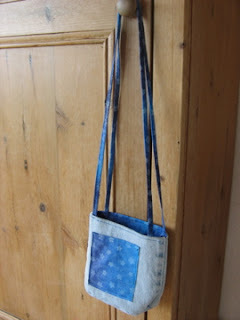 The outside of the bag is a portion of a jean leg. It already had the side seams, which I was happy about. Less work for both me and my machine, who likes to jam up on me when the fabric is very thick like that. All I had to do to the jean part was add an oval bottom to give the bag some roominess and a fun shape. Since all the fabric was either given to me or taken from something old I no longer use, this was an amazingly cheap project. I'd say it cost me mere cents to make (because of the cost of the thread used to sew it). It's not perfect, since I didn't feel like measuring anything to make it. Lambchop #2 is very proud of it, though, and wanted to take it to school with him this morning to give it to the birthday girl right way (though her party is on Wednesday afternoon). I think we can fill it with candy before then just in case she doesn't find a bag very exciting. 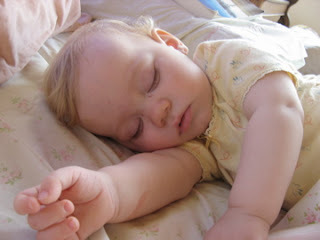 And, this morning I couldn't help but snap a few shots of Lambchop #3 sleeping. I took way more than necessary, but that's the beauty of digital cameras - one is bound to turn out right. Here's the one I liked best (oh, and for you thrift shoppers, this is a thrift shop shirt she's wearing - it was in perfect condition). Now I'm off to do some actual chores. Our dryer's heating element seems to have given out, so I'm forced to be both more frugal and more environmentally friendly. With a baby, it can be hard to make it out to hang clothes. I need to take advantage of Lambchop #3's nap really fast before she wakes up. Maybe I should consider installing some kind of baby swing in a nearby tree, because I really do enjoy hanging clothes (except when we've got high winds and I have to fight the line to hang them).